This is second post for today. HERE is my first post! and the lovely Jenn Shurkus has made us this gorgeous mood board to give us some inspiration! This week we are showcasing My Favorite Things Products. You don’t have to use them for the challenge but if you have them we would love to see them used. MFT is one of my favourite company. Wish I had all the budget to get everything they release every month 🙂 Anyway, it was hard choice to choose the stamp set to play with for this inspiration challenge. 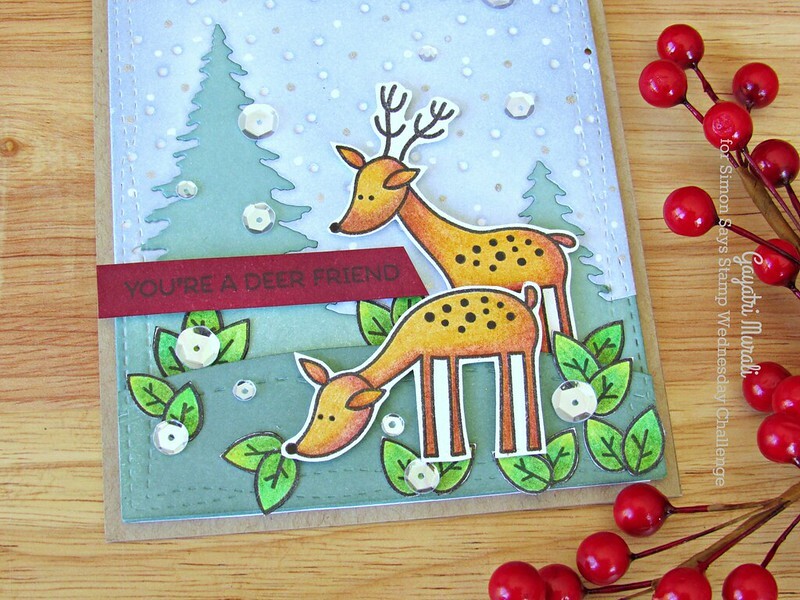 Finally I settled on Deer Friends stamp set to play with. 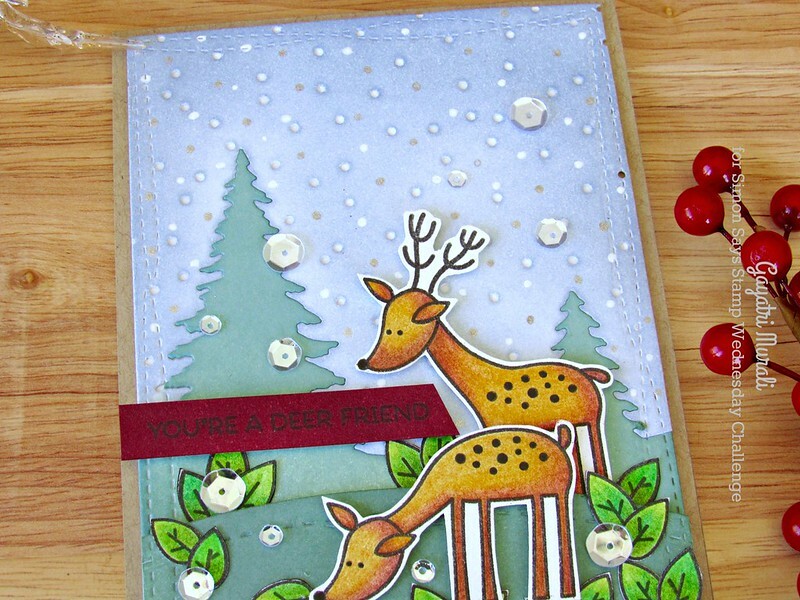 I stamped and coloured the deers and leaves from the stamp set using PrismaColour pencils. I then hand cut them all. Wish I had the coordinating dies. My eyes went out of focus like crazy trying to cut them out. One of the perks of being in 40s I guess. I will here on get the coordinating dies for sure Lol! 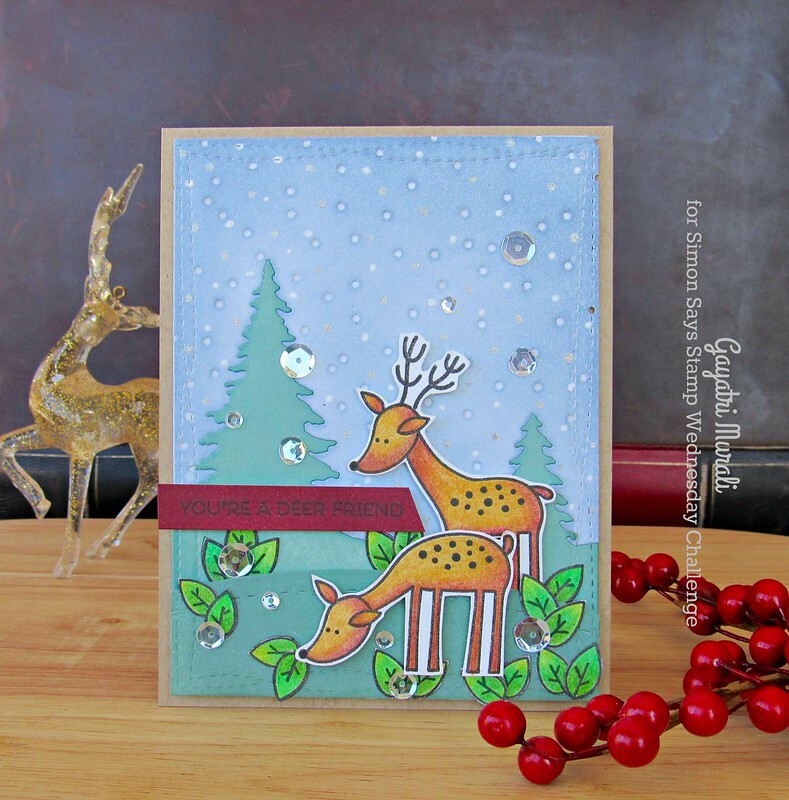 For the background, I used Simon Says Stamp Soft Snowfall die. I die cut using white cardstock and sponged the sky part of the die with Barely Blue Simon Says Stamp ink. Then the bottom part with Laurel Green Simon Says stamp ink. I then put the top and bottom of the die cut together and die cut using MFT’s Wonky Stitched Rectangle die set. I used the largest die in the set. I also die cut another panel using the same wonky stitched die and die cut a slope layer using SSS slopes and Hills die. To assemble the card, I used kraft card base. Adhered the background panel using craft foam, the slope layer using foam adhesives. Then I adhered the deers and the glued the leaves. 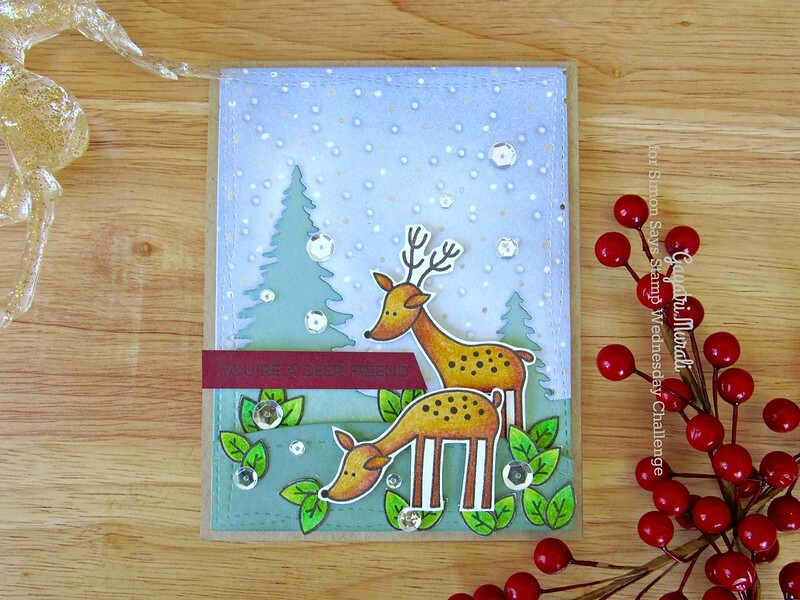 I added more snow dots on the background using Sakura gelly roll white and sparkle pens. 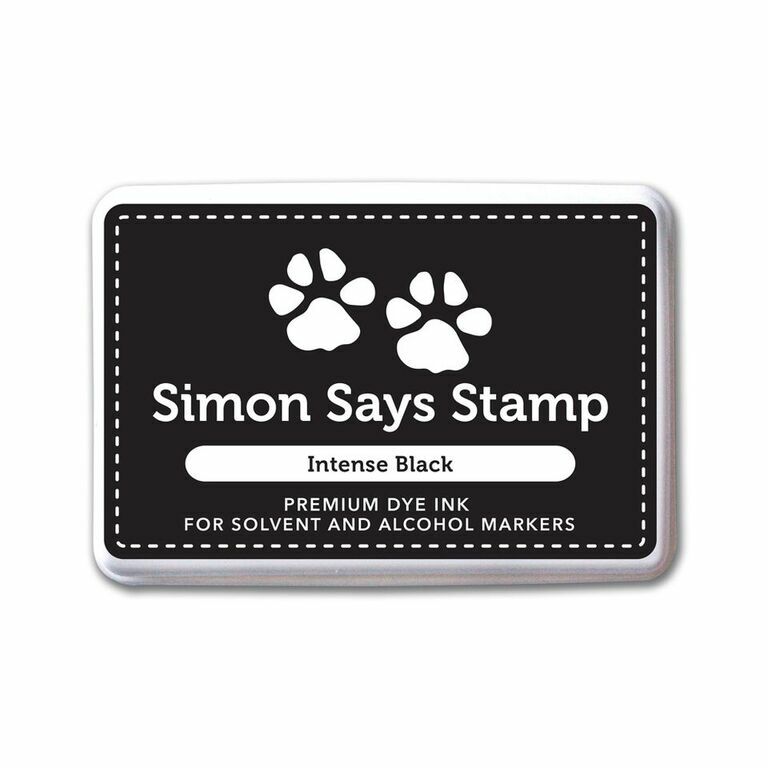 For the sentiment, I black stamped the sentiment from Deer Friends stamp set on a strip of card stock sponged with Merlot SSS ink. In the hindsight I would have white heat embossed the sentiment to make it pop. Finally I embellished the card using PPP Sparkly Clear sequins. I absolutely LOVE the colour combination. Muted colours yet pretty. I love it. Hope you do too. All the supplies I used to make this card is listed below. Thanks for for stopping by blog. LOVE this card, Gayatri! Why have I never noticed these adorable deer before? Wonderful use of the colors! hi gayatri! this is adorable, luv your coloring and the snowy background! have a great rest of the week and weekend!